Our exclusive and brand new to 2015 luxury dog boarding kennels are situated in beautiful rural countryside on the outskirts of the village of Glenmavis. Brackenhirst Kennels provides a peaceful and relaxing setting for your dog, offering views of fabulous wildlife and gorgeous countryside and woodlands. We are a small family run establishment with only 19 kennels allowing us to provide a quiet, calm and relaxing environment. Our staff to dog ratio is one member of staff to every 5 kennels which enables us to operate a personalised service tailored to meet your dogs individual needs. Our new purpose built kennels are all extremely spacious and comprise of an indoor heated room with an attached and enclosed outside area to ensure your dog stays dry throughout the day. All indoor areas and rooms have individual thermostat controlled underfloor heating, have all walls and ceilings fully insulated and have soft music played throughout the day. All dogs who stay with us are exercised at least 3 times per day. We have mono blocked areas throughout the kennels along with a designated artificial grass area (as we are aware that some dogs may have grass or other related allergies). The area surrounding the kennels has been secured with 8ft strong security barrier fencing to ensure the safety of dogs in our care. In addition we have high spec CCTV surveillance operating 24 hours a day. We would advise that you ensure your dog arrives at kennels wearing a collar and lead, to enable easy handling of your dog – this will allow our staff to attach our Brackenhirst Kennels ID tag which will stay on during your dogs time in our care. 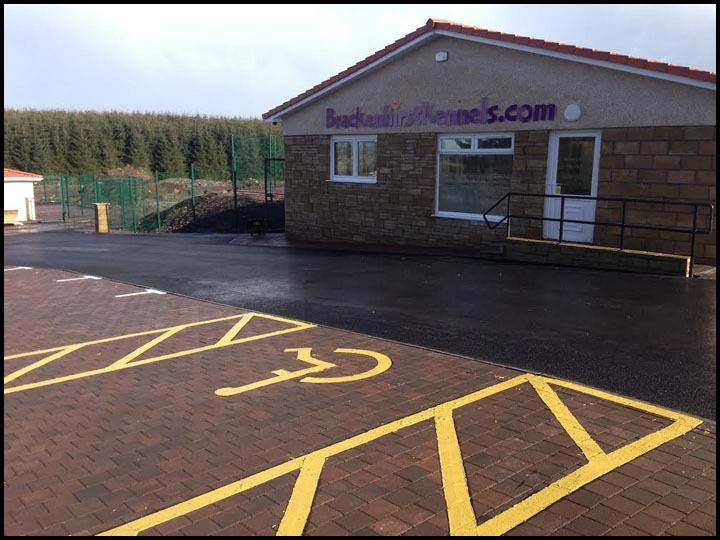 Anyone wishing to come along and view Brackenhirst Kennels prior to booking with us, are more than welcome to do so. Please call to make an appointment.